I appreciate everyone taking their time to apply! It’s a day early, but Stardew Valley is now available for Android on the Google Play Store! It’s $7.99 USD, but for regional pricing please check the store. I hope you enjoy playing Stardew Valley on your Android device. Update: Stardew Valley for Android has a release date — March 14th! Just want to give you a quick update… Stardew Valley for Android is on it’s way, and is now open for Google Play pre-registration. The android version will be priced at $7.99 (the same as iOS). Please check the Google Play Store to see the price in your region! Like the iOS version, this is the full version of Stardew Valley, up to 1.3 (but not including the multiplayer functionality). Transfer of PC save data is supported, so you can carry over your game without having to start over! English, Russian, Japanese, Spanish, Portuguese, Italian, French, German, Hungarian, Korean and Turkish language support will be available at launch (coming to iOS and consoles in a future update). Save at any time – even when you close the app! I also want to let the Xbox/PS4 players know that the multiplayer update is coming along well… the XBOX update is in QA, and PS4 will follow shortly. I hope to release both, simultaneously, within the next couple of months. I’ll let you know as soon as I have anything more concrete to share with you. Thanks so much for your patience. Update: The new languages are now live on Steam/GOG. Thanks to everyone who helped me test out the beta. The Steam beta for French, Turkish, Italian, Hungarian, and Korean is here. If you speak any of those languages, and want to help me find bugs, typos, or even just give feedback on the new text, it would be a big favor and I’d really appreciate it! While it’s very unlikely that playing the beta version will threaten your save files, I recommend backing them up anyway. Your save files can be found in the “%appdata%/StardewValley/Saves” folder (on PC). The Xbox and PS4 multiplayer updates are still in development, but are coming along well, and I will let you guys know as soon as I have more information on that. & thanks for playing Stardew Valley! A few weeks ago I announced that I’ll be self-publishing Stardew Valley on most platforms (everywhere except Nintendo Switch and mobile). Today, that transition takes effect. So, as of today, for PC, Mac, Linux, XBox One, Playstation 4, and PS Vita, if you have any questions, comments, or business inquiries, please send them directly to me. I now bear 100% of the responsibility for these platforms! Now, I’d like to tell you guys what I’m up to, and what’s in store for the future of Stardew Valley. As many of you know, I’ve been working on a new game for a while. I haven’t revealed anything about it, except that it takes place in the same universe as Stardew Valley. I’ve been deliberately secretive about it because I want to be able to work on it without any pressure for the time being. I also want to make sure the concept is fully realized before revealing anything, because once it’s out there, I’m going to have to fully commit to it. I’m a pretty cautious person when it comes to this sort of thing. Now, I believe I’ve said in the past that I wanted to devote all my time to the new game, and I might not work on any new Stardew Valley content. Well, that’s not exactly true. While there have been times in the past where I felt burnt out, and maybe even said that I wanted to move on, I always find myself coming back to Stardew Valley. For one, I keep getting new ideas for ways to improve and expand upon the game. This world is so full of potential, I could probably work on it for the rest of my life. There’s also such a wonderful community surrounding the game… and I like making you guys happy. I’m extremely grateful to all of you for supporting my work and creating this wonderful Stardew Valley community. I wouldn’t be where I am today without you. And knowing that there’s still tons of people out there who love the game and would be extremely happy to get new content motivates me to keep working. In short, what I’m saying is that I am going to keep making new content for Stardew Valley. In fact, I’ve recently put my other game on the back-burner and have been in the process of creating a new free content update. French, Korean, Italian, and Turkish translations are also underway, though they may not come out until early next year. I’m aware that saying “I’m working on new content” might be aggravating to those on consoles who don’t have the 1.3 update yet… Or to those on Switch who are experiencing frame rate issues in the new patch. I also haven’t forgotten about the PS Vita users, some of whom have reported bugs to me. It’s very important to me that I make good on my promises… the idea of expanding further while there are still lingering issues and unmet promises disturbs me, and isn’t something I want to be doing. So I want to make it clear that these issues are my top priority, and if there’s ever anything I can do to help these things happen more quickly, it takes precedence over any new content… however, I don’t do those ports myself, they are done by Sickhead Games, so there’s nothing I can personally do to have an effect on that process, beyond setting it into motion (Sickhead Games does great work, by the way… and they are making very fast progress on the console updates). I am also doing what I can to see the issues with Switch multiplayer get fixed, but that is also not something I can directly accomplish. So when I do work on new content, it’s only when I have no current avenue for addressing these higher priority issues. So, currently I’m working on a new Stardew Valley update, and my new game is on hold for the time being. The difficult thing is that I want to work on both… I want to keep working on Stardew Valley and I also want to work on my new game. But I don’t have enough time to accomplish my goals with both things simultaneously. For a while, I considered being finished with Stardew Valley altogether. But that would make me (and many others) sad. 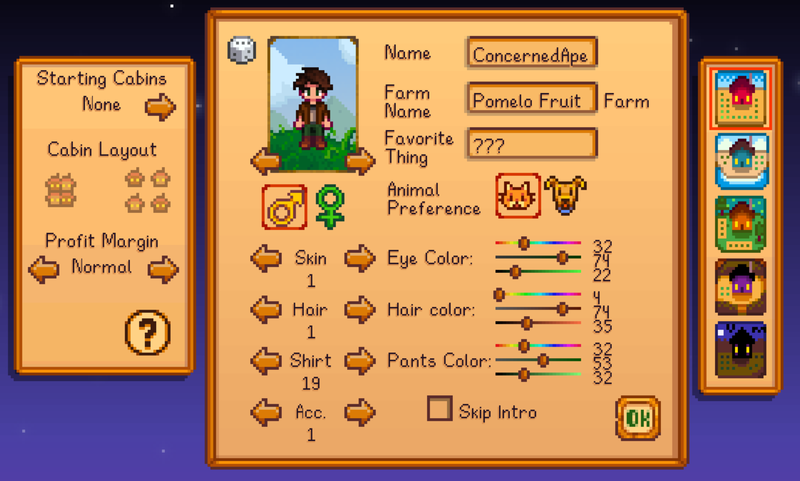 So I’ve decided that I’m going to form a team to help me work on future Stardew Valley content. The update I’m working on right now (1.4) will be another solo update, but after that I hope to have a team in place that I can work closely with on future content. This is going to be a big change for me… I’ve always worked alone, and working with a team is a whole new ballgame. However, just as I did with Stardew Valley originally, I’m just gonna go for it, and have faith that I can rise to the occasion and make it work. My hope is that the new team will help take some of the workload off me, so I have enough breathing room to divide my time between my new game and Stardew Valley. I still plan on having a very active role in the future of Stardew Valley, and the originator of all major Stardew Valley decisions and content. And there are many aspects of development which I’ll never be okay with handing over to another, like music or writing. But when it comes to programming, fixing bugs, administrative/business work, or even pixel art… I think I’d be okay with having some help. I’ll post more about this later. My top priority is to see the 1.3 multiplayer update come to Xbox One & Playstation 4, and for issues with the Switch patch to be addressed. I am working on a new game, but I’ve put it on hold in order to create a new Stardew Valley update (1.4). French, Korean, Italian, and Turkish translations are in the works, though they may not come out until early next year. Once the team is in place, I’ll divide my time between Stardew Valley and my new game. I am now self-publishing on all platforms except Nintendo Switch and mobile. on Wednesday the 12th of December. It will be available across the North American, European, and Japanese Nintendo eShop regions. A big thanks goes out to Tom Coxon from Chucklefish, who developed the multiplayer netcode which made this update possible. Also, a big thanks to Sickhead Games for porting it to Nintendo Switch! You can invite 1-3 friends to join you in the valley, either starting from scratch or diving in from an existing single player save. Each player will have their own Cabin on the farm, and you’ll be able to work together to achieve common goals such as farming, mining, fishing, foraging and festival participation! The state of the Stardew Valley game world, including the main storyline, is shared between all players on the farm, as well as the pool of money you accumulate. However, each player will have their own private inventories, skills, achievements, collections, individual relationships, quests, and crafting/cooking recipes. As more hands are better than one, you may wish to change the difficulty level of your collective farm, which you can achieve by scaling the profit margins.In terms of marriage, players can choose to woo the eligible folks of Pelican Town, or craft a wedding ring to propose to a fellow player. If the other player accepts the ring, the couple becomes engaged! On Nintendo Switch you’ll be able to communicate with others on your farm using the Switch online voice chat or the new chat box feature with colored text and nearly 200 custom Stardew Valley emojis. You can also play together via local communications play, meaning that 2-4 switch consoles can connect & play together over a short distance without the need for a Nintendo Switch Online account. While the new 1.3 single player content has now been available on PC for a little while now, I’ll keep things vague to avoid spoilers for anyone who hasn’t come across them yet. For 3 days in Winter you’ll be able to visit a traveling festival called the Night Market, which will visit Pelican Town. Here farmers can come and go as they please to purchase unique items, enjoy live entertainment and more! There are now new character events to encounter, including some secret events triggered by certain conditions… Some of these even grant you permanent bonuses. Your horse can now wear hats and Signs are now craftable items, available to you from the beginning of the game. Next up is the PS4 and Xbox One Multiplayer updates, which is my top priority. I’m working with Sickhead Games to get these to you as soon as possible… I really appreciate your patience. Hope you’re having a nice holiday season & thanks for reading! I’ve got a pretty big announcement today. Starting December 14th, I’ll begin self-publishing Stardew Valley on PC, XBOX, PS4, and PSVITA. On those platforms, I (ConcernedApe) will be both publisher and developer. However, Chucklefish will remain publisher on Nintendo Switch and Mobile platforms. When I first released Stardew Valley, I was a complete novice to the video game industry. Chucklefish, as my publisher, oversaw the distribution, console ports and translations of the game. They set up the official wiki and helped me redesign the website, to great effect. And of course,Tom Coxon did amazing work adding network code to the game, making multiplayer a reality. But I’m at a point now where I’m ready to move forward on my own. I think self-publishing is the dream of most indie developers, and I’m happy to be in a place where that’s possible! Expect some more announcements concerning the future of Stardew Valley soon… stay tuned! Hey everyone, a patch just went live on PC… mostly bug-fixes, with a few minor changes. Fixed rabbit’s foot not affecting the breakup scene in non-English language modes. Fixed a few rare-ish crashes that can occur when connecting to another player’s game. Fixed crash when saving after the game adds Lewis’s shorts to Marnie’s house. Fixed “double sound” when using singing stone. Fixed babies sometimes spawning in houses that don’t belong to the parents. Fixed only one player being able to get the dark talisman. Fixed the inability to place donated items on the bottom two rows of the museum. Fixed farmhands being unable to pick up items they dropped in festivals. Fixed Pam’s upgraded house interior event not happening. Fixed visual glitches caused by triggering a shared event simultaneously with the return scepter. Fixed softlock caused by mistaken ability to use daggers during events. Fixed players all receiving the same personal overnight events on the same day (e.g. spouse asking if you want a baby). Fixed farmers getting stuck in the fishing casting animation after picking up someone else’s rod. Fixed host sometimes appearing stuck using tool in shared events. Fixed softlock when you play the Journey of the Prairie King past 2am. Fixed glitched chest lid appearing when you destroy a cabin. Fixed duplicate songs in the jukebox. Fixed only one player’s glow ring working at a time. Fixed farmhands not being able to see each others’ bundle changes. Fixed bug causing some players to become married to two other players in 3-4 player farms. Fixed player sometimes getting stuck in bed after another player got in and then back got out. 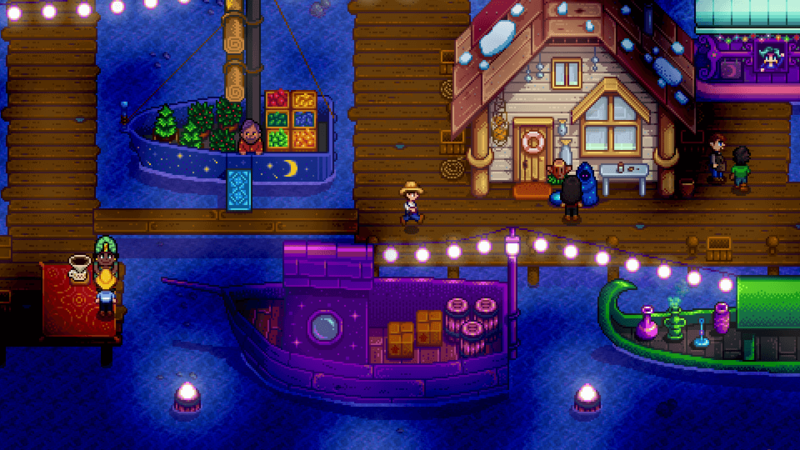 Stardew Valley 1.3 (Multiplayer Update) is now available! This update is a significant change for Stardew Valley… Not only does it include a good amount of new content (new items, events, etc. ), but it also includes the long-awaited addition of co-op multiplayer! Several months ago, I finished working on the content additions, and turned my attention to finishing multiplayer. Progress on that front came along steadily. Then, we started the multiplayer beta on April 30. Of course, I underestimated the number of bugs you’d all find! But over the past couple months Tom and I have worked hard to track and fix every known multiplayer bug. And now, it’s ready to go. Credit must be given to Tom Coxon (of Chucklefish), who wrote all the major networking code himself and turned this fairly complex game into a seamless multiplayer experience! We’ve worked hard to make the co-op experience as fun and intuitive as possible. I also want to thank everyone else at Chucklefish for all their hard work coordinating this big launch! Below, I’ll give you a more detailed explanation of both the new game-play content and a more detailed explanation of how multiplayer will work. For three days in winter, a traveling festival visits Pelican Town. Unlike a normal festival, farmers can come and go as they please, and the location isn’t “locked out” at any point (there’s no setup). Pelican Town is different for a few days, and most of the townspeople’s schedules change to reflect that. The festival offers farmers a once-a-year chance to acquire unique items, purchase an original work of art from the famous Lupini, enjoy some live entertainment, and more…. There are new character events, some of which grant you permanent bonuses. There are also a couple of “secret” events that you’ll only encounter if certain conditions are met. Signs are craftable items which are available to you from the very beginning of the game. Any item in Stardew Valley can be “clicked” onto the sign, and it will display that item (the item won’t be consumed). A variety of new outdoor decorations have been added, including many that are “seasonal”, meaning that their appearance changes with each season. Multiplayer makes decorating even more fun. An expensive item that can be placed in a barn and automatically harvests milk and wool from the animals each morning. Garden pots allow you to grow any crop indoors year-round. Think of them like one-tile greenhouses. When placed outside, however, they only grow crops that are in-season. There is a new crop that only grows indoors. This means you can move your fireplace around, and also buy a couple of different kinds of fireplaces. Stardew Valley now supports up to 4 player co-op. Co-op is nearly identical to single-player, but with 1-3 other friends playing together with you to achieve a common goal. Any single player game can be “converted” to a co-op game by having Robin build one or more cabins on your farm. One player serves as the host, and the other 1-3 players connect to the host in order to play. Therefore, the host must be in-game at all times when the group wants to play. “Starting Cabins” gives you the choice to start a new game with 1-3 cabins pre-positioned on the farm. If you decide to go this route, you’ll have two “Cabin Layouts” to choose from: “Nearby”, which places the cabins close to one another, encouraging a communal farming style, and “Separate”, which places the cabins far apart and allows for more independence. Alternatively, you can start with no pre-positioned cabins and instead build them yourself (via Robin). “Profit Margin” adjusts the profit margin of goods that you sell. You can choose between “Normal” (the original Stardew Valley amount), “75%”, “50%”, and “25%”. This is, in effect, a way to increase the difficulty of the game. For larger groups of experienced players, it might be desired. However, keep in mind that there already is some “scaling” of difficulty built into the game, since each player will need to upgrade their own tools, upgrade their own houses, buy bigger packs, etc. In co-op, all players share the same pool of money, and are working together on the same farm. The state of the game world, including the main storyline, is shared between all players. However, each player has their own private inventory, skills, achievements, collections, relationships, quests, and crafting/cooking recipes. In general, it’s assumed that co-op games are only being played with people you trust. The game maintains no real concept of “ownership”, since all players are working communally on a shared farm. When it’s time to go to bed, all players must enter their beds. Only then will the day end. Players can marry each other by crafting a “wedding ring” (An old Zuzu City tradition), and offering it to another player. If the other player accepts the ring, the couple is now engaged. The chat box allows you to communicate with each other… with the help of nearly 200 custom Stardew Valley emojis! Also, want to let you know that the console versions of multiplayer are in development & coming soon.